April 13, 2017, Owatonna, MINN. — Southern Minnesota Initiative Foundation's (SMIF) AmeriCorps LEAP (Learning Early Achieves Potential) Initiative is accepting placement site applications from PreK education providers in its 20-county region. 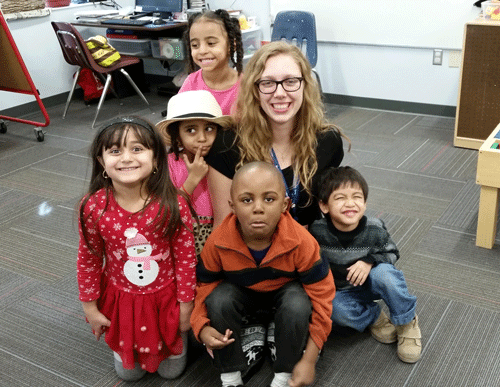 AmeriCorps LEAP members serve in early childhood education settings and work with children on social-emotional skill development to prepare southern Minnesota preschoolers for kindergarten. AmeriCorps LEAP sites are matched with a full-time or part-time member trained on brain development, adverse child environments, the impact of stress on the brain, social and emotional regulation and school readiness skills. Members also promote routine home reading with parents/caregivers through monthly book gifts. AmeriCorps members are a value-add to preschool classrooms; they use evidence-based tools proven to calm body and mind, over time changing behaviors and building confident learners. Members receive ongoing professional and SEL skill development through monthly meetings sharing best practice on tools and strategies in the classroom. "AmeriCorps members’ presence in the classroom is a huge added value to our Head Start classrooms and to every child in our program," said Erin L. Visker, Head Start Mental Health and Disabilities Advisor at Minnesota Valley Action Council, Inc. "By taking some of the social-emotional teaching and learning away from our classroom teachers, this frees our staff to focus more on reaching academic goals, which in turn, processes better outcomes in all areas of learning for our children." The 2017-18 AmeriCorps LEAP Initiative service term is an 11-month commitment beginning with an orientation mid-August and ending July 15, 2018. All members receive a living allowance and Segal education award ($5,775 for FTE members and $2,887.50 for PTE members) that can be used to pay off student loans or tuition and books costs at local colleges. A health care or child care benefit is also available if needed. Applications are due April 30, 2017 and on SMIF's website: www.smifoundation.org.